Partial reprint of the May 1953 (US) issue. Details supplied by Tom Lesser. Partial reprint of the June 1953 (US) issue. Details supplied by Tom Lesser. 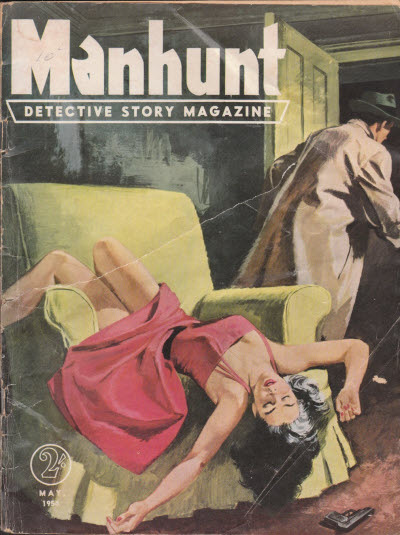 Partial reprint of the July 1953 (US) issue. Details supplied by Tom Lesser. 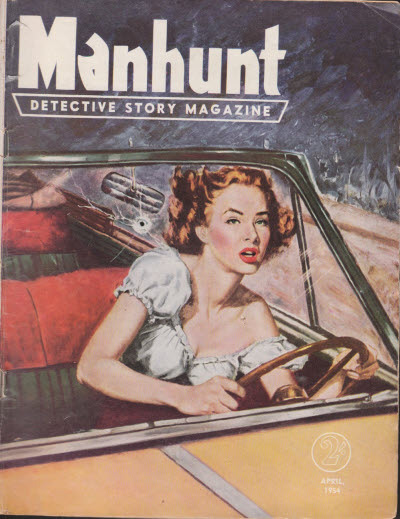 2 · The Wench Is Dead · Fredric Brown · nv Manhunt Jul 1953; later expanded as The Wench Is Dead, Dutton, 1955. 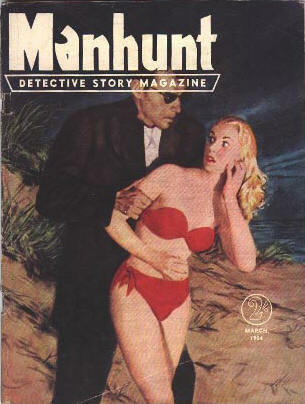 Partial reprint of the August 1953 (US) issue. Details supplied by Tom Lesser. 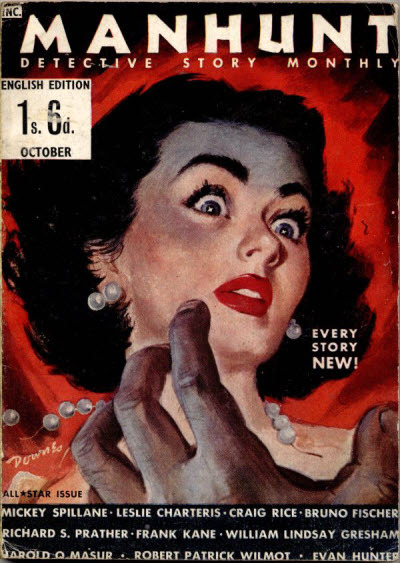 Partial reprint of the September 1953 (US) issue. Details supplied by Tom Lesser. 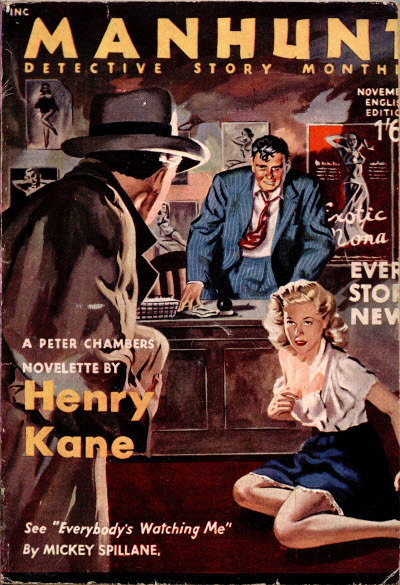 Partial reprint of the October 1953 (US) issue, plus a single story from the May 1943 (US) issue of Ellery Queens Mystery Magazine. Details supplied by Tom Lesser. 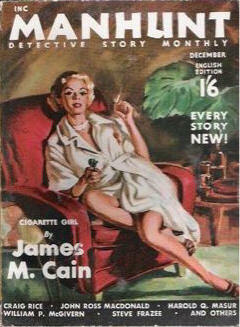 Partial reprint of the November 1953 (US) issue. Details supplied by Tom Lesser. 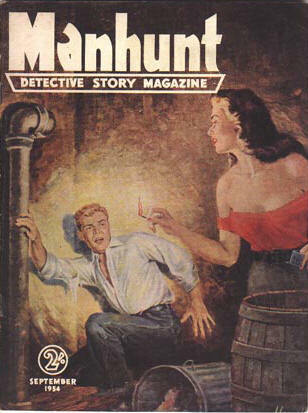 Partial reprint of the January 1954 (US) issue, plus a single story from the December 1953 (US) issue. Details supplied by Tom Lesser. Partial reprint of the December 1953, January 1954 and February 1954 (US) issues. Details supplied by Tom Lesser. 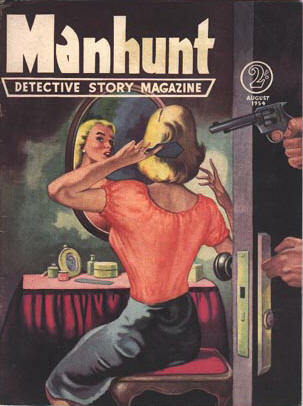 British reprint edition of Manhunt. 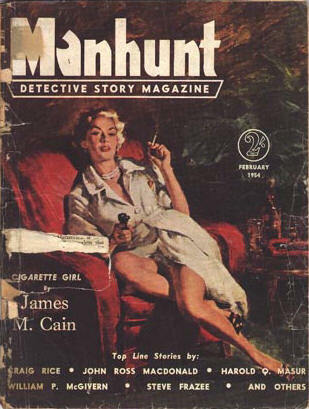 Reprint of the January 1953 (US) issue. 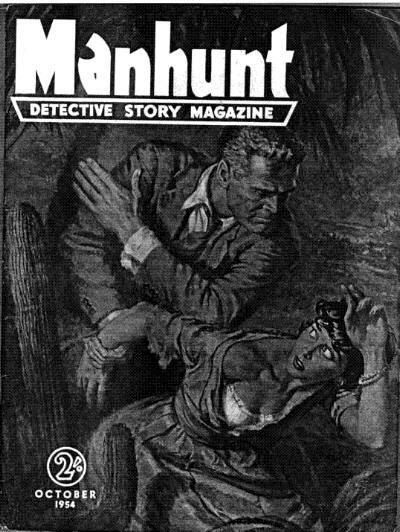 The Hunted · William Irish · nv Manhunt Jan 1953; revised from Death in the Yoshiwara by Cornell Woolrich (Argosy, January 29, 1938). 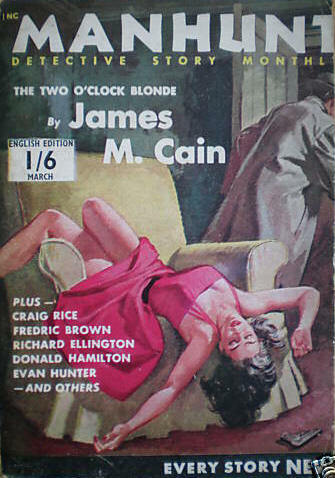 Reprint of the February 1953 (US) issue. 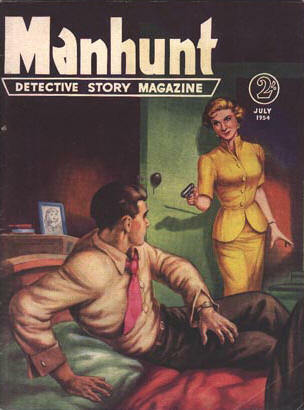 Partial reprint of the March 1953 (US) issue. 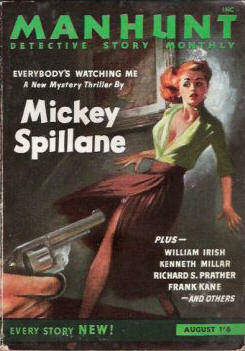 Reprint of the April 1953 (US) issue. Partial reprint of the June 1953 (US) issue. 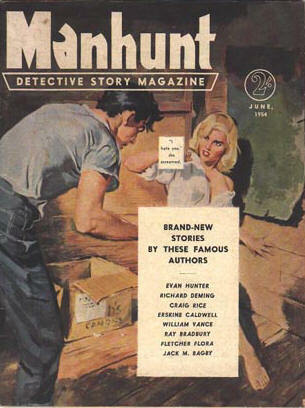 Partial reprint of the July 1953 (US) issue. 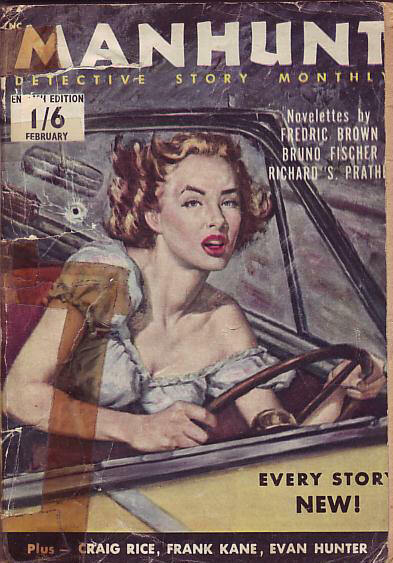 27 · The Wench Is Dead · Fredric Brown · nv Manhunt Jul 1953; later expanded as The Wench Is Dead, Dutton, 1955. 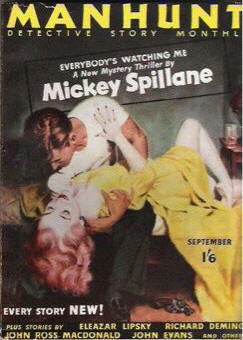 Reprint of the August 1953 (US) issue.